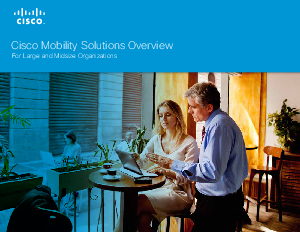 Cisco has acknowledged the need to address our customers’ array of employee and consumer mobility requirements with a full set of mobility solutions. These solutions are designed to help IT plan, design, and implement a mobility journey that securely improves productivity, enables new ways of doing business, reduces costs, and mitigates risk. Because each organization has a different urgency associated with embracing these solutions, we have designed the solutions to build out incrementally so that they can be adopted at a pace that meets your business priorities.